The MH-60R Seahawks will add to lethal capabilities of the Indian Navy at a time when China is expanding its presence in the Indian Ocean region. Designed for hunting submarines as well as knocking out ships and conducting search-and-rescue operations at sea, the Lockheed Martin-built helicopters, would replace India’s aging fleet of British-made Sea King helicopters. THE US has approved the sale of 24 multi-role MH-60R Seahawk maritime helicopters to India at an estimated cost of USD 2.6 billion, the State Department has announced, boosting the Indian Navy’s anti-surface and anti-submarine warfare operations as China expands its presence in the Indian Ocean. Designed for hunting submarines as well as knocking out ships and conducting search-and-rescue operations at sea, the Lockheed Martin-built helicopters, would replace India’s aging fleet of British-made Sea King helicopters. The Trump Administration on Tuesday notified the Congress that it has approve sale of 24 MH-60R multi-mission helicopters, which will provide the Indian defence forces the capability to perform anti-surface and anti-submarine warfare missions. The helicopters are designed to operate from frigates, destroyers, cruisers and aircraft carriers. In its notification, the State Department told the Congress that this proposed sale will support the foreign policy and national security of the US by helping to strengthen the US-Indian strategic relationship. The sale, at an estimated cost of USD 2.6 billion, will improve the security of a major defensive partner which continues to be an important force for political stability, peace, and economic progress in the Indo-Pacific and South Asia region, it said. “The proposed sale will provide India the capability to perform anti-surface and anti-submarine warfare missions along with the ability to perform secondary missions including vertical replenishment, search and rescue, and communications relay,” said the Congressional notification. India will use the enhanced capability as a deterrent to regional threats and to strengthen its homeland defense, the notification said, adding that India will have no difficulty absorbing these helicopters into its Armed Forces. The proposed sale of this equipment and support will not alter the basic military balance in the region, it said. 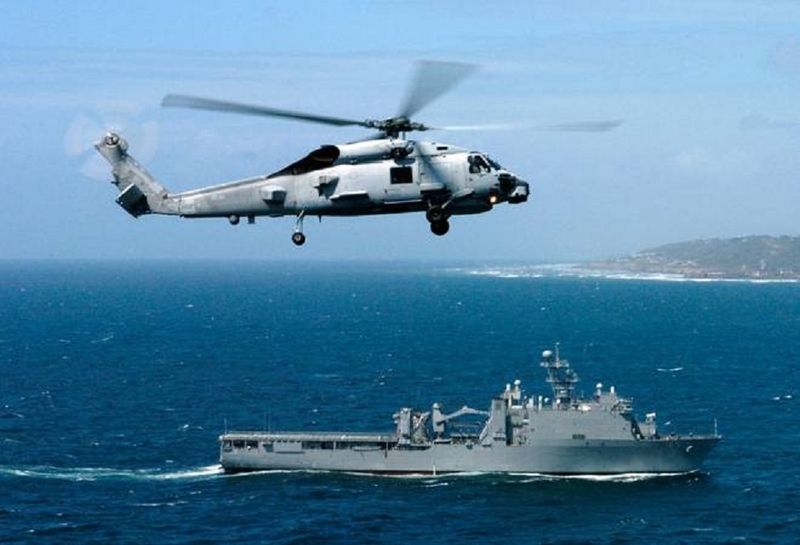 The MH-60R Seahawks would add lethal capabilities of the Indian Navy, which experts say is the need of the hour given the aggressive behaviour of China in the Indian Ocean region. Currently deployed with the US Navy as the primary anti-submarine warfare anti-surface weapon system for open ocean and littoral zones, the helicopters are considered the world’s most advanced maritime helicopter. According to industry experts, it is the most capable naval helicopter available today designed to operate from frigates, destroyers, cruisers and aircraft carriers. According to US Naval Air System Command, the MH-60R Seahawk missions are anti-submarine warfare, anti-surface warfare, surveillance, communications relay, combat search and rescue, naval gunfire support and logistics support. As the Navy’s next generation submarine hunter and anti-surface warfare helicopter, the MH-60R Seahawk is considered to be the cornerstone of the Navy’s Helicopter Concept of Operations.